The Liddy Shriver Sarcoma Initiative firmly believes that collaboration among researchers is an extremely important way to accelerate progress in finding more effective treatments and cures for the various subtypes of sarcoma. Two International Collaborative Grants (ICG) in liposarcoma that the Initiative has awarded demonstrate what can be achieved. Using funds from the first Wendy Walk and a generous donation from Laura Somerville, the Initiative awarded a grant in 2010 for research on well-differentiated and de-differentiated liposarcoma. The grant created an international team of sarcoma researchers that has been working together for two years (the WDLPS Team). The collaboration includes a Norwegian group led by Drs. Myklebost and Meza-Zepeda and an Australian group led by Dr. Thomas, with the early involvement in the US of Dr. Maki at Memorial Sloan-Kettering Cancer Center and Dr. Barretina at the Broad Institute. Here is a brief summary of some of their findings to date. The WDLPS Team has successfully isolated and sequenced several neochromosomes (NCs), generating insights into the mechanism of formation, and the structure of the NC. Well-/de-differentiated liposarcoma is characterized by a massive abnormal chromosome, found in almost all tumors. This chromosome, termed a neochromosome (NC) is the vector that carries dozens of copies of two key cancer genes, MDM2 and CDK4.The neochromosome comprises a core composed of approximately 31 million base pairs (Mb) captured from multiple normal chromosomes. These captured regions are highly amplified, so the final size of the core region is approximately 640 Mb. Almost 200 genes appear to be highly amplified, and the WDLPS Team has systematically interrogated these genes for their role in cancer formation. In addition to known cancer genes, they have identified some new candidates (e.g. NUP107). Using mathematical modeling, they now know that the neochromosome forms by a process known as breakage-fusion-bridge (BFB). Why BFB occurs in WDLPS is not clear, but hints are emerging that suggest a defect in normal DNA repair mechanisms. Such defects are required for a cell to tolerate these massive structures. By understanding the nature of the DNA repair defect, they may learn a new point of weakness in well-/de-differentiated liposarcoma. The WDLPS Team is gaining an understanding of how WDLPS cells respond to the two most important new drugs in liposarcoma clinical trials: inhibitors of MDM2 and CDK4. The WDLPS Team has generated spontaneously resistant WD/DDLPS cell lines by prolonged culture in the presence of Nutlin, an MDM2 antagonist. They have observed that resistant cells tend to be genetically unstable and to have greatly increased methylation across the genome. They have also deep sequenced the resistant cell lines, looking for genetic changes that may be linked to drug resistance. A gene called HSP90, which may mediate stress signals, appears to be mutated in resistant cells. They are now working on understanding whether this finding is recurrently found in resistant cells, and how it may generate resistance. They have developed a functional genome-wide screen for genes modifying sensitivity to the Pfizer lead CDK4 inhibitor (CDK4i). Using massively parallel, genome-wide RNA interference and robotic techniques, they are screening a library of 30,000 genes for their ability to modify the sensitivity of WDLPS cells to the CDK4i. This screen is partially complete, and they hope to have the results by the end of this year. By systematically defining key genes required for the actions of the CDK4i, they hope to understand why these drugs work in some cases, but not in others. One recent model is from a patient with de-differentiated liposarcoma carrying an amplified MDM2 and a normal p53 gene, but resistant to an MDM2 inhibitor. This model is the first of its kind and will be of great value in understanding resistance to MDM2 inhibitors. The WDLPS Team has tested six WD/DDLPS cell lines for their ability to grow in mice in order to develop useful preclinical animal models of WDLPS. Two out of the six lines formed tumors efficiently and can therefore be utilized as in vivo preclinical models. The same six WD/DDLPS cell lines had the ability to differentiate, showing characteristics of fat. They also investigated the stem cell-like features of these lines. The LPS141 cell line was the only cell line in their panel harboring a stem cell-like subpopulation. The microRNA, let-7, is implicated in both differentiation and stem cell properties, and is a potential drug target. They have determined the expression level of each of the members of miRNA let-7 family, and the protein expression level of key target genes of let-7, such as HMGA2, RAS and c-Myc. Thus, this team is now in a good position to pick suitable cell lines for the subsequent studies. Finally, they have characterized the LPS cell lines with respect to migratory and invasive characteristics and performed proliferation analyses. The detailed characterization will be useful for future preclinical analyses and has been recently published as a scientific manuscript. The WDLPS Team is undertaking a detailed study of a key regulatory protein, HMGA2. HMGA2 may be both amplified and rearranged in particular in liposarcomas. Currently the grant focuses on small RNAs of the Let-7 family, that counteract the activity of this gene. Such small RNAs have successfully been used for the treatment of human tumors transplanted into mice, and may be future medicines. The WDLPS Team is investigating the use of such experimental drugs in cell cultures, and soon in tumor-bearing mice. This is a collaboration with the US company Mirna Therapeutics, and improved targeting will be pursued in collaboration with Norwegian company PCI Biotech. Using funds from the second Wendy Walk, the Initiative awarded a grant in April 2012 for research on the other major type of liposarcoma, myxoid liposarcoma. This grant brings together another international team of sarcoma researchers working together for two years (the MLPS Team). The collaboration between the Canadian group led by Dr. Torsten Nielsen, the US group led by Drs. Dina Lev and Alex Lazar, and the Dutch group led Dr. Judith Bovée has the ultimate goal of developing a multi-investigator driven “bed-side to bench and back” program for the study of myxoid liposarcoma that would remain operative beyond the Initiative's funding timeline. To accomplish this, the team is assembling the world’s largest clinically annotated, high quality frozen and formalin-fixed human myxoid liposarcoma tissue repository, and developing and characterizing urgently needed experimental research models. They are using these resources to unravel myxoid liposarcoma-associated biomarkers and molecular predictors of therapeutic response, treatment resistance and disease outcome. They intend to elucidate the molecular mechanisms underlying myxoid liposarcoma biology to identify pathways that can be targeted with existing or experimental therapies and to assess the anti-myxoid liposarcoma effects of biologically justified therapeutic strategies. The MLPS team includes several clinician-scientists who are actively involved with clinical trials groups in the USA, Canada and Europe, positioning them to move promising new research findings into clinical care more rapidly than might otherwise be possible. Current work includes monitoring a clinical trial of HDAC inhibitors, assessing biological similarities between MLPS and other sarcomas that may suggest common therapeutic strategies, and validating biomarkers that may direct an anticancer immune response. Although this group was only recently brought together, they have already begun sharing materials, strategies and unpublished results, engaged new team members dedicated specifically to myxoid liposarcoma research, and reached out to other researchers worldwide to accelerate scientific progress as much as possible. The WDLPS Team has held two workshops in Oslo Norway, one in 2011 and one in 2012, as well as meeting at the 2010 and 2011 Connective Tissue Oncology Society meetings. The two workshops have included other liposarcoma researchers from various countries as well as the members of the WDLPS Team. 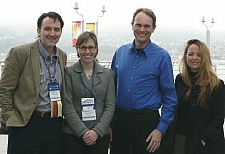 The MLPS team met in Vancouver in March 2012 to plan their research strategy. The most recent workshop in Oslo brought together the WDLPS Team with some members of the MLPS Team for a productive interchange. The two teams are planning on meeting again at this year’s Connective Tissue Oncology Society meeting in Prague in November to share their latest data and plan for an open collaboration. Arrangements are in place for many members of both teams to meet in Gothenburg, Sweden at the European Musculo-Skeletal Oncology Society meeting in 2013. The plan is to make these LPS workshops a regular part of the calendar moving forward. Taken together, these two complementary International Collaborative Grants have enabled a substantial body of research, whose fruits are beginning to emerge. Researchers who previously worked in isolation have come together, synergizing their expertise and undertaking efficient programs of research toward the common goal of understanding liposarcoma to help those afflicted by these diseases as much as possible, as soon as possible. The work described above has already led to submissions for further research grants in Australia, Norway and Canada, one published work and another in preparation. The past four years have seen the emergence of new possibilities for treatment of WDLPS and MLPS, founded on new drugs and advances in the molecular understanding of each disease. Liposarcoma is as challenging clinically as it is as a research subject. The collaborations engendered by the members of Team WDLPS and Team MLPS have set the stage for the next wave of research focused on this family of diseases. These studies were made possible by Laura Somerville ($50,000) and by the dedicated and inspirational family behind the Wendy Walk ($450,000). Both Wendy and Laura are currently fighting liposarcoma. The Wendy Walk was created by Wendy's children, Ali, Matt and Jackie, who are inspired by their mother’s strength, courage, faith, and unwavering positive attitude.